Meda Consumer Healthcare brings you trusted specialty brands in multivitamins, iron supplements, personal hygiene, alertness aids and cold & flu. Our products empower individuals to actively manage their health and wellness. 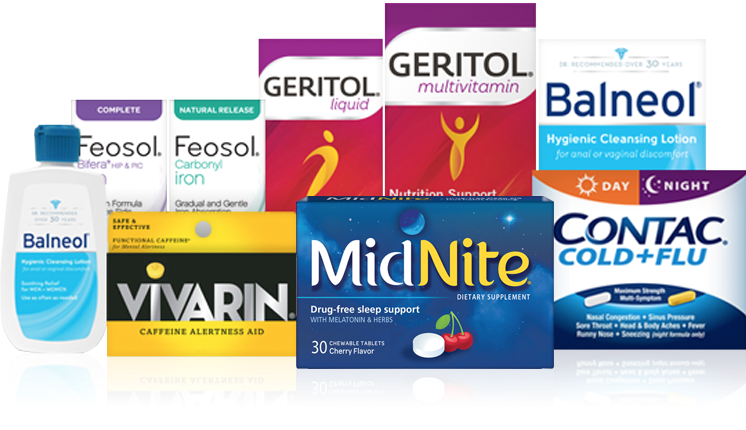 While you may not know Meda, you probably know and use our consumer healthcare brands including: Feosol®, Balneol®, Contac®, Geritol® and Vivarin®. These well-known household brands form the core of our product portfolio and can be found on the shelves of all major food, drug and mass merchant stores nationwide. Contac® and Vivarin® are also found in convenience and dollar stores, as well as hotel gift shops and airport stores. Wherever you go, you’ll find Meda Consumer Healthcare brands! We have focused on building a family of trusted, time-tested, specialty products available over-the-counter — so you might notice that our brands are fairly diverse. What they have in common is that each product is truly unique and effective.